Last week I shared with you all my thoughts on Wet n Wild's Photo Op Eyeshadow Compact in Desert Festival, from the Fergie Center Stage Collection. Also part of the Fergie Center Stage family are the Perfect Pout Lip Colors, which we are going to be taking a look at today. I picked up three shades to try out-V.I.Pink, Fuchsianista, and Ferguson Crest Cabernet ($3.99, each). The perfect pout lip colors are formulated with anti aging properties, and they are infused with vitamins and minerals to help keep lips feeling moisturized, conditioned, and smooth. 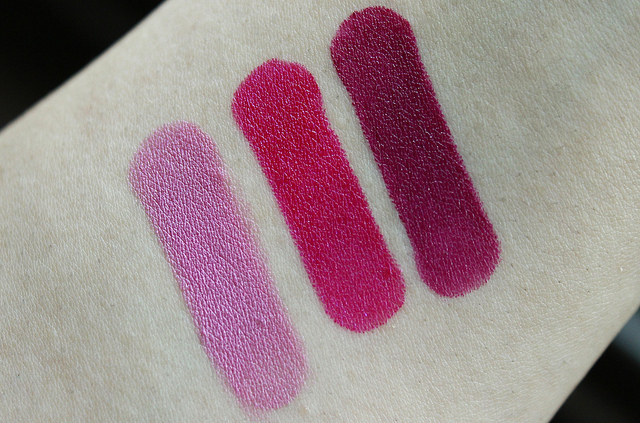 V.I.Pink, Fuchsianista, Ferguson Crest Cabernet (the lip colors don't swivel all the way down in the tube. Be careful with dents when placing on the cap). V.I.Pink: Cool blue-pink. Lately, light pinks have been my lip color of choice for daily wear. I like how V.I.Pink isn't overpowering on. It's just right for days when you fancy a little color on your lips, without going full force. Fuchsianista: Vivid fuchsia pink. Of course I just couldn't resist picking up a showstopping bright like this one. Fuchsianista is a great pick if you are looking for a fun, bold statement lip color. It won't disappoint. Ferguson Crest Cabernet: Plum berry. I obviously had autumn/winter on my mind when I grabbed this one. My pictures couldn't quite capture the plum tones in this lip color. The berry is there, but this is definitely more plum and less red in person. I am certain that Ferguson Crest Cabernet is going to be in heavy rotation during the cooler months, when the berry lip season is in heavy effect. All three of these lip colors feel smooth and lightweight on the lips. They don't enhance any dryness, or flakes either, which is a plus. They have smooth consistencies, and they glide on my lips really nicely. Although, I did notice a tiny bit of tugging at my lips when I applied V.I.Pink. But it's not a huge deal breaker. The pigmentation on these is out of this world. You don't really have to do a lot of building up on the color, since these already pack a huge color punch. When it comes to longevity, I can get about 4-5 hours of wear time until fading begins. The two darker hues-Fuchsianista and Ferguson Crest Cabernet, do leave behind a stain that lasts awhile. Overall: I love it when I come across pigmented lipsticks that are not only affordable, but good quality too. I am definitely going back for more shades! I will probably try some neutrals, next. What do you all think of Wet n Wild's Perfect Pout Lip Colors from the Fergie Center Stage Collection?